An OIC (offer in compromise) has been the life preserver of many a delinquent taxpayer over the years, but there’s also icing on the cake. The IRS has good news for taxpayers with circumstances that make payment difficult to impossible. You may remember it. It’s an OIC due to Exceptional Circumstances. Owing the IRS is stressful enough, but for a disadvantaged taxpayer, the pressure of that delinquency can weigh even heavier. Disabled, chronically ill or taxpayers unable to enter a typical OIC may have reprieve. If after computing an offer amount your client doesn’t have the assets to pay the full amount due, there are options. The OIC due to Exceptional Circumstances helps them avoid economic hardship. The IRS understands that life happens. Unplanned events or life circumstances such as serious or chronic illness can drive a wedge between assets and liabilities. In certain cases, paying the full amount – even when deeply reduced by an OIC – may impair taxpayers’ ability to provide for himself or herself or a family. There are times it would be impossible to manage the financial arrangements set forth by the IRS. The first step is to submit a narrative explaining your client’s circumstances. Advise clients to provide documentation to support claims about their situation. If they can provide an adequate description, the offer might be accepted despite provision of a financial profile. Then attach those documents to an application and submit. Sound complicated? Learn more about OIC and other services you can offer your clients as a member of IRS Solutions. Our forms, letters and training webinars help tax professionals navigate the murky waters between clients and the IRS. Grab our FREE Pricing Guide and begin generating more income immediately. It’s smooth sailing from this point forward. 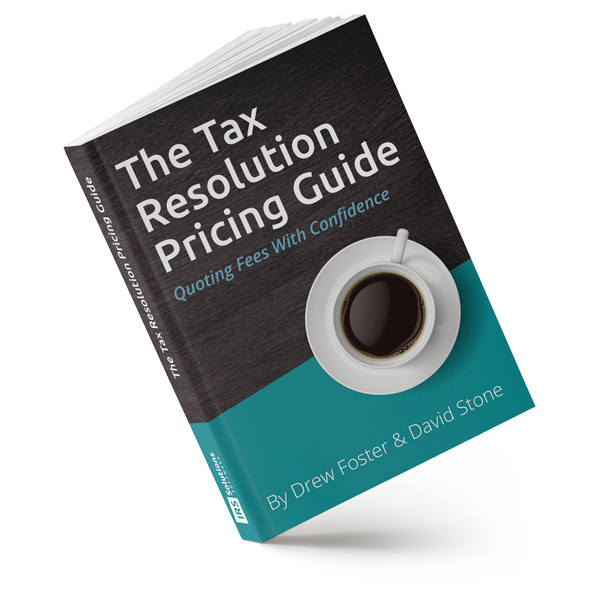 Not Sure How to Charge for Tax Resolution Services? Get the Tax Resolution Pricing Guide and bi-weekly newsletter updates that contain valuable insider tax resolution information. Sign up today!